A Carbon nanotube (CNT) is a member of the fullerene structural family that forms cylindrical carbon molecules, their name being derived from their size and composition. The diameter of a CNT is on the order of a few nanometers, while they can be up to several centimeters in length. They exhibit extraordinary strength and unique electrical properties, and are efficient conductors of heat. Their remarkable mechanical and electrical properties make them potentially useful in a wide variety of applications (e.g., nano-electronics, optics, materials applications, etc.). There are two main types of nanotubes: single-walled (SWNTs) and multi-walled nanotubes (MWNTs). Other than impurities, the CNT is formed entirely of carbon atoms. The structure of the carbon is a hexagonal web (ggraphene sheeth) rolled into a cylindrical tube, sometimes with a "cap" at each end of the cylinder (SWNT). Cylinders may exist inside other cylinders like the layers of a leek vegetable, with a gap of 0.34 nm between cylinders (MWNT). Some pentagonal (fivesided) and heptagonal (seven-sided) defects can cause cylinders to bend, change diameter, or twist. Well established characterization methods for CNTs include scanning tunneling microscopy or transmission electron microscopy, which provide the ability to measure the nanotube diameter or the chiral angle. The nanotubes however, can be damaged by the electron beam in the microscope. In order to non-destructively characterize the tubes, Atomic Force Microscopy (AFM) and Confocal Raman Microscopy can be used. AFM reveals information concerning the structural morphology, whereas the Raman spectra of the tubes directly describe the chemical composition and the molecular structure. For example, it is possible to identify the diameter of the tubes, their orientation depending on polarization, different electrical properties, and even to distinguish SWNT and MWNT. To show the capabilities of Confocal Raman Microscopy, this study investigates carbon nanotubes with the WITec alpha300 R.
Raman signals of CNTs show dependence of the exciting laser wavelength. Raman spectroscopy on SWNT is a resonant Raman scattering process of single photons, providing insight into the photonic and electronic structure of one-dimensional carbon molecules in their bonding environment. The radial breathing modes (RBM), can be found at low wavenumbers (120-350/cm) and are the result of coherent vibration of carbon atoms in the radial direction. The position of the RBM provides information on the diameter of the nanotube, the intensity of the peak elucidates the electronic structure of individual tubes, the combination of both parameters then allows the characterization of the structure of SWNTs. Like all resonant processes, the intensity of the Raman scattering from SWNT strongly depends on the wavelength of the excitation laser. This study shows results from one and the same sample area analyzed with 514nm (Fig. 1a and b) and 633 nm (Fig. 1 c and d) excitation wavelength, respectively. Using a 514 nm excitation, SWNT with a diameter ranging from 0.9 nm (Fig. 1a red spectrum) to 1.42 nm (Fig. 1a blue spectrum) are detected, their distribution is shown color coded in Fig. 1b. Application of a 633 nm excitation laser, SWNT are detected with structural properties fulfilling the resonance conditions. Figure 1. Confocal Raman Imaging on Carbon Nanotubes, Scan Range: 20x20 ƒÊm, 120x120 pixels = 14400 spectra, 92 ms/spectrum, 1800 g/mm grating. (a) Typical spectra at 514 nm; (b) Distribution of corresponding nanotubes on the silicon substrate; (c) Typical spectra at 633 nm; distribution of corresponding nanotubes. For future applications of carbon nanotubes in the biomedical field (e.g. drug carriers), as well as potentially hazardous issues, it is important to obtain detailed knowledge about the interaction of carbon nanotubes with individual cells. In this example carbon nanotubes were applied to single cells in a cell culture (epithelial mouse cells) and imaged with confocal Raman microscopy after being fixed on the substrate. Figure 2a shows the distribution of the carbon nanotubes (green) on the cell. In order to determine the level of uptake of the nanotubes in the cell, a depth scan was performed in x-z plane along the indicated line. Figure 2b shows the distribution of the nanotubes in the cell clearly revealing that the nanotubes are not only located on the cell surface but also within the cell. Figure 2c shows the spectra used for generating the images. The green spectrum represents the CNTs, the red spectrum corresponds to the cell. Figure 2. (a) Confocal Raman imaging of carbon nanotubes on a cell, 50 ƒÊm x 50 ƒÊm; 150 x 150 pixels = 22500 spectra; 120 ms/spectrum at 532 nm excitation. (b) Depth scan along the white line indicated in Fig 2a. 30 x 50 ƒÊm, 100 x 80 pixel = 8000 spectra, 110 ms/spectrum. (c) Spectra used for generating the images in Figure 2a and 2b. Green: Nanotubes, Red: Cell. Due to the manifold electronic properties of carbon nanotubes, various attempts have been made to incorporate carbon nanotubes into integrated circuits for optimized circuit design. Confocal Raman Imaging can be used to locate the nanotubes with respect to electrodes or other interconnects. Additionally, the properties of the nanotubes can be determined in detail by their spectra. In this experiment, electrodes of a silicon integrated circuit were imaged with Confocal Raman Microscopy. The microscopic video image of the circuit in Fig. 3a does not show any hint of the presence of carbon nanotubes, whereas the Raman image in Fig. 3b clearly shows that the nanotubes (red) accumulate near the electrodes. 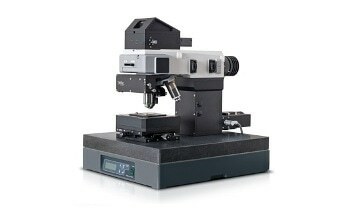 Using Atomic Force Microscopy in a combined system configuration of the alpha300 series, it is even possible to determine whether they are attached to the electrode or not. Fig. 3c shows a spectrum of such a nanotube revealing that the nanotube is a semiconducting type. Figure 3. (a) Video image of electrodes of an integrated circuit. (b) Raman image of the electrodes showing an accumulation of the nanotubes near the electrodes. Scan range: 30 x 30 ƒÊm, 120 x 120 pixels = 14400 spectra, 86 ms/spectrum at 532 nm. (c) Spectrum of the Si-Substrate and a nanotube at the electrode. This information has been sourced, reviewed and adapted from materials provided by WITec GmbH. For more information on this source, please visit WITec GmbH.